We reported in detail when the news of the first Tesla car in India first emerged on the cyberspace. Actually, the Prashant Ruia, CEO, Essar Group has imported the Model X into India. The Model X is an all-electric SUV that has taken its home market by a storm. Today, we have a video here that shows the first Tesla car in India being driven on the public roads of Mumbai. ALSO SEE- Tesla India Launch Not Happening Anytime Soon? The Model X that you has been imported into our country comes in the entry-level 90D trim. It has a price of GBP 88,188, which is INR 75,73,188. However, thanks to the really high import duties, we are pretty sure the owner would have had to shell out upwards of INR 1.5 crore. The 90D trim of the Model X comes with a 90 kWh Battery pack that sends power to a motor at each axle. The vehicle has a claimed range of 257 miles and can reach 60 mph (96.56 kmph) from a standstill in just 4.8 seconds. The Model X is available in many seating configurations – 5 Seat, 6 Seat, and 7 Seat. It runs on 22-inch wheels and looks pretty futuristic. The Tesla Model X shares in plenty with the Model S. It gets LED headlamps with cornering lights along with the falcon doors. It also offers the much publicized Tesla Autopilot driver assist feature that offers features like lane departure warning and adaptive cruise control. Other features include an Air Suspension, GPS, Bluetooth, All-wheel Drive, Touchscreen interfaces, parking sensors, automatic emergency brake and stability control. 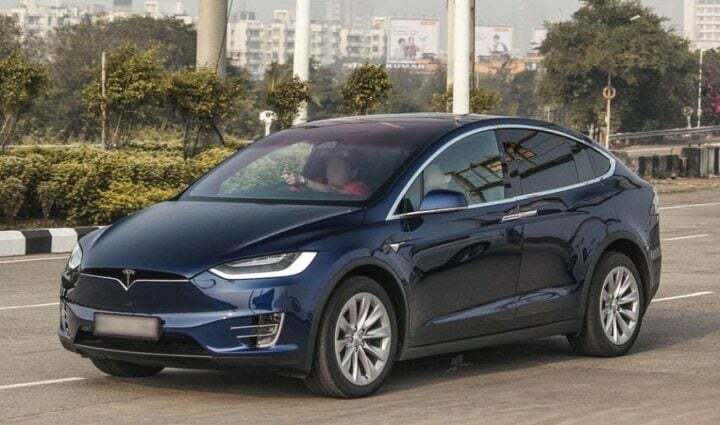 So, what are your views on the first Tesla car in India? You can share them with us by penning them down in the comments section below.